I spent a lovely day doing a workshop with Susan Harris. The quilt I chose to make was "Spinning Stars" and is all handpeiced, hence the reason I did not get much done. I ditched my green fabric at the beginning of the day and picked up a lighter, brighter green from the "Sew Creative" girls. This lifts the star which was going to be too dark. trying to get my hands on a copy. 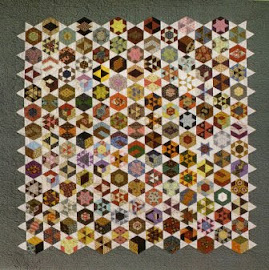 She has been reproducing antique quilts for a long time and her work is lovely. The day finished with a great meal of oven cooked pizzas cooked on the spot by 'Crumpy's Crusts" a mobile wood fired pizza caterer. The pizza's were delicious. Thanks to the 'Sew Creative ' girls in Gatton for organising a great couple of days. Your Spinning Stars is wonderful. Was that a pattern just for class or is it available for purchase? I love reproduction quilts and bought Classic Quilts when it came out in the 1990s. It was rare to find a book on reproducing antique quilts in those days and I was so happy to find it. So jealous that I could not go! That quilts looks wonderful Penny, and I do love the colours. I just stumbled across your blog. Thanks for featuring my designs and class. I am glad you enjoyed the class. Copies of my book are still available if anyone would like to contact me via : aquiltaday@yahoo.com.au Thanks Susan Harris.